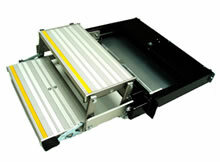 The Stayco 2C550 double cassette step is unique in the concept of a double treaded step unit that closes into a cassette case with a depth of less than 100mm. The step unit is designed to work with FWD vans that would normally have a cut-out flip step to provide a stair of two treads between the ground and the vehicle floor. The 2C550 (Patent applied for) has none of the disadvantages of a cut out flip step. These include the high labour cost of the installation, the modification to the door lower track which in some cases can affect the vehicle warranty and the need for the driver to bend down and deploy the step by hand. The 2C550 is installed under the vehicle floor as simply as any cassette step and is entirely operated by foot. It provides a tread surface 76mm below and 104mm above the bottom edge of the vehicle sill lip when deployed. When stowed the ground clearance under the vehicle sill lip is reduced by less than 100mm.